This is a welcome and admirable book. How do contemporary American female comics perform onstage, and what does this performance reveal about power relations in our culture as well as the existence of a "female" and, more specifically, "feminist" genre of stand-up comedy? In this long overdue study of women and stand-up comedy, Joanne R. Gilbert explores these questions in order to illuminate the social, political, and cultural implications of power and gender in popular entertainment. Gilbert’s research recognizes the problems that arise from assumptions made about the genres of "female" and "feminist" humor and ultimately suggests that these are part of a larger genre she calls "marginal humor." Performing Marginality provides a historical overview of female comic performance and offers a taxonomy of comedic postures assumed by contemporary female comics, providing a useful way to categorize this often overlooked genre. 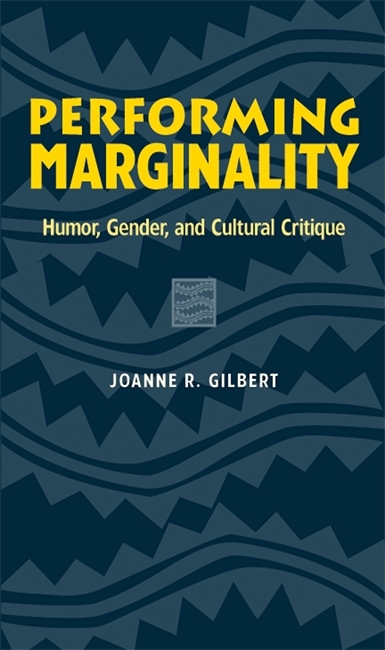 Performing Marginality also examines problems in existing studies on the subject, the politics involved with marginal humor, and the role of audience in comic performance. This book develops the notion of "performing marginality" not only as the way female comics perform their gender onstage, but as the means by which all of us construct, contest, and negotiate our gendered, racialized, and otherwise marked identities in everyday life. As a former professional stand-up comic and current scholar of communications and women’s studies, Gilbert offers a unique perspective on gender, humor, and power through the lens of contemporary female comic performance. Joanne R. Gilbert is associate professor of Communication and director of Women’s Studies at Alma College. An academic study of stand-up comedy performed by females is long overdue, and its importance for understanding power structures in our society cannot be underestimated. This book will add to the paucity of studies currently available in both women's humor and stand-up performance." It is a pleasure to read such an interesting, well-researched, well-written, and important book. The volume, in the Humor in Life and Letters Series edited by Sarah Blacher Cohen, is simply one of the very best books yet written on standup comedy and women's humor. This is a welcome and admirable book." The materials that Gilbert has assembled speak to each other in a remarkable variety of ways. Her choices-and they represent a wide spectrum of women's work-are a smart way of making connections and illustrating her theoretical points on theoretical, cultural, and historical levels."